C.S. Lewis bemoaned, in The Abolition of Man, that the West was becoming a culture of men without chests – meaning we have either lost the courage of our God-given convictions or in many cases denied those virtues altogether. This is amply illustrated by relativistic “tolerance”, which has been used for too long as a counterfeit “virtue” to attack what is true, beautiful and moral. Lately, however, those who rationalize Jihadist atrocities in the name of “tolerance” – and who then protest that we must not “offend” Islam – are causing more and more people to reject the moral bankruptcy of their squishy relativism. I don’t want a central government that promises to solve all my problems by demanding the power to run my life. Such utopian schemes always lead to intolerance and tyranny. Instead, I want a central government which insures that the foundations for a healthy society are strong, so I then can build the kind of life that God wants for me, my family, my church and the community where I live. A central government that promises to solve all my problems is a government that seeks to usurp the rights and responsibilities God has given to individuals, the family, the church, local communities, and voluntary associations of folks working together to make their lives better. Ban street preachers from public places, because open evangelism is “offensive”. Bar side-walk counselors outside abortion clinics, because pro-life activists are “judgmental”. Prohibit a fourth grader from reading her Bible in class, because she might become “close minded”. Censure God from a valedictorian’s speech, because he can’t be “disrespectful” of other view points. Force a bakery owner to cater homosexual weddings, because he’s an “intolerant” fundamentalist. Compel an evangelical adoption agency to place babies with unmarried couples, because “discrimination” against other lifestyles is wrong. Penalize churches that support marriage integrity referendums, because they’re engaged in “hate speech”. One day soon, you are going to wake up to a new world where your liberty to pursue virtue as an expression of your faith – and your right to proclaim those beliefs in the public square – are gone. Vice is now using “tolerance” to bludgeon virtue, and virtue is currently losing. This newest weapon in the war against virtue has met with great success – and, most disturbing of all, the naïve support of many “Christians”. Somethings, it seems, never change. It hasn’t taken long for the Christian postmodernists among us to start accusing their brothers and sisters in the Lord of bigotry, intolerance and hate simply for eating yesterday at Chick-fil-A. In the last 24 hours, I’ve seen several blogs and related Facebook comments along those lines. Really? Bigotry, intolerance and hate? I saw no evidence of that yesterday. Have some become so trapped in their postmodern sensibilities that it now is wrong to stand up in a civil, respectful manner against those who want to use the power of government to silence a man of faith – and block his businesses? Simply this: Affirming his personal support of marriage as God has ordained it in His written Word, while nonetheless being open and embracing of all who patronize his establishments regardless of their sexual orientation or differing views. Let’s get a grip, folks. S&P downgraded the United States last night. I hope and pray that this will serve as a wake-up call for the Church to realize that Biblical precepts can’t be mocked if any nation wants to survive. If God’s people don’t begin to understand, articulate and follow those precepts, then there is no hope. One of those precepts is that God has ordained certain roles and responsibilities for civil government, and Scripture has lots to say about how individuals, families, the Church, the State and voluntary associations are to function. However, there is not a single verse or example in all of Scripture which lends any credence to the view that God has given civil government the right or responsibility to re-distribute wealth or provide for our individual health or income. See The Growing Idolatry of Civil Government. There is something in the prophetic personality that loves the thunder, the lightning and the storm. I get a kick out of standing outside and watching the dark, billowing clouds roll in. 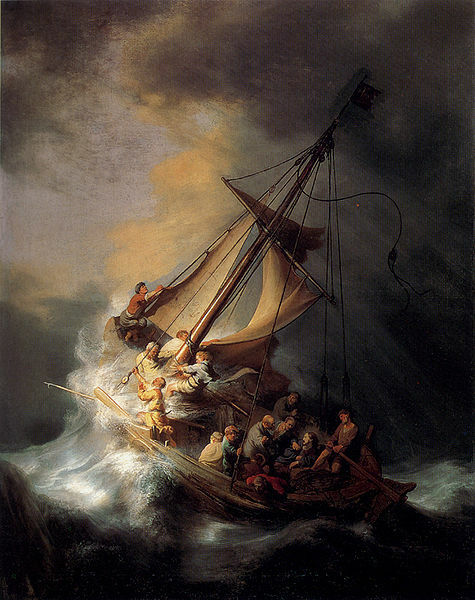 We feel God’s majesty in turmoil, and know that He often uproots before He establishes. I think we feel His mercy more deeply, but also differently. Because our personalities are especially attuned to His power and redemptive judgment, we more fully appreciate His grace. That’s why we embrace the oppressed and battle tyrants, while relishing the storm.